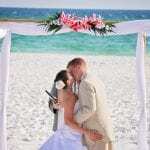 Destin Beach Weddings are elegant, classy, and everything you have been dreaming of. Destin is situated in Northwest Florida and known for its breathtaking white sand beaches, countless golf courses, and world class resorts and rentals. It’s the perfect place to truly relax and unwind from everyday life. If you consider yourself adventurous, you’ll love parasailing in the emerald green water, jet skiing with the dolphins, or learning how to surf. 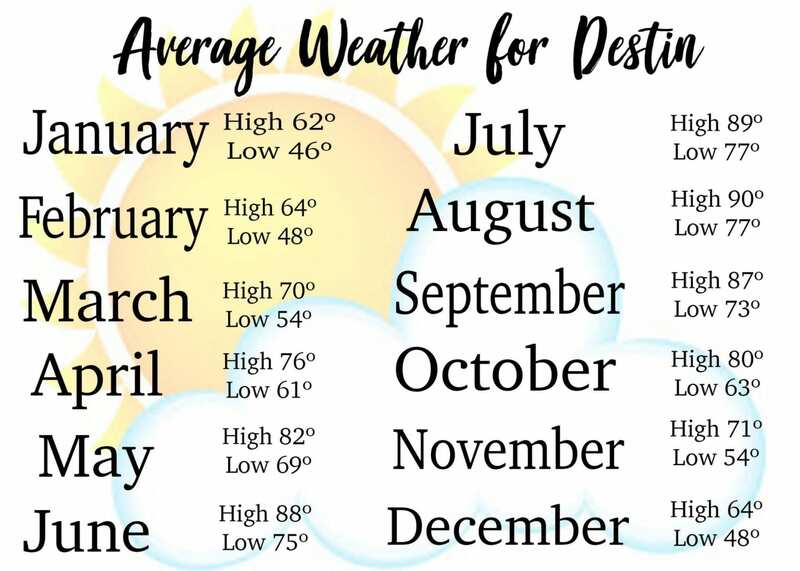 Be sure to check out The Links Golf Club, Burnt Pine Golf Club, or Raven Golf Club, three of the most beautiful golf courses in Destin if you enjoy golfing. When you’re feeling hungry, stroll along the Destin Harbor Boardwalk until you find a restaurant that peaks your interest. If you’re craving some fresh and delicious seafood, you can’t go wrong with AJ’s Seafood & Oyster House or Dewey Destin’s Harborside. End your day with the stunning views of a Destin sunset. If you’re in search of a unique and stunning wedding destination, Destin beach will exceed your every expectation. You can say “I do” in a romantic setting that you may not be able to replicate in your hometown. Whether you only involve you and your spouse, a select handful of friends or family, or 200 of your loved ones, you won’t regret getting married in Destin. 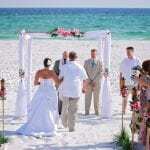 Destin beach wedding packages are far less stressful than traditional weddings. They are simple, beautiful and affordable. 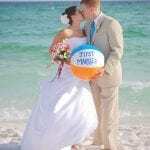 If you trust Florida Beach Weddings with your big day, you can sit back, relax, and enjoy a stress-free wedding. Traditional weddings can become very expensive very quickly. 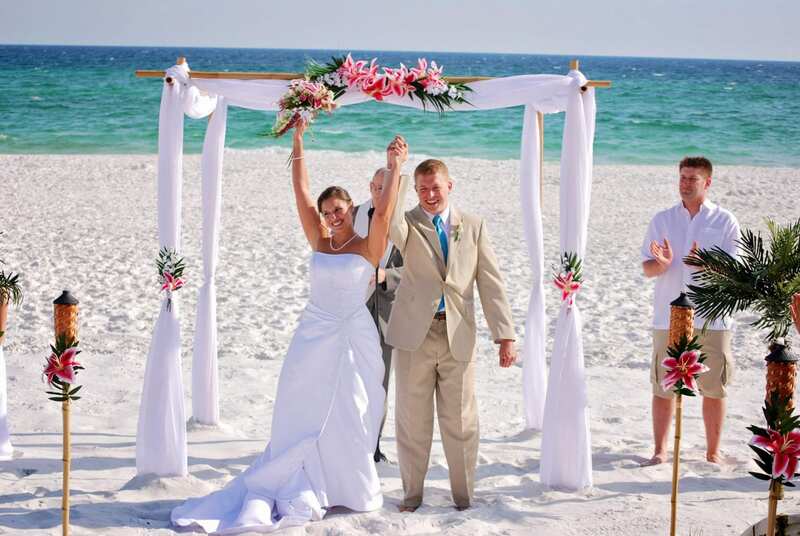 If you’d like to host an unforgettable wedding without breaking the bank, you can’t go wrong with a Destin beach wedding. You won’t need to spend a lot of money on decor, formal attire, or renting a venue. 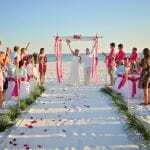 Beach Wedding packages in Destin come complete with everything you need for your Florida beach wedding ceremony to be a success. Florida beach weddings are appreciated for their intimacy. Unlike at a traditional wedding, you’ll be able to spend time with your guests before your wedding day. You won’t have to worry about spending your wedding day greeting everyone because you will make memories with them when they arrive to Destin a few days before your big day. 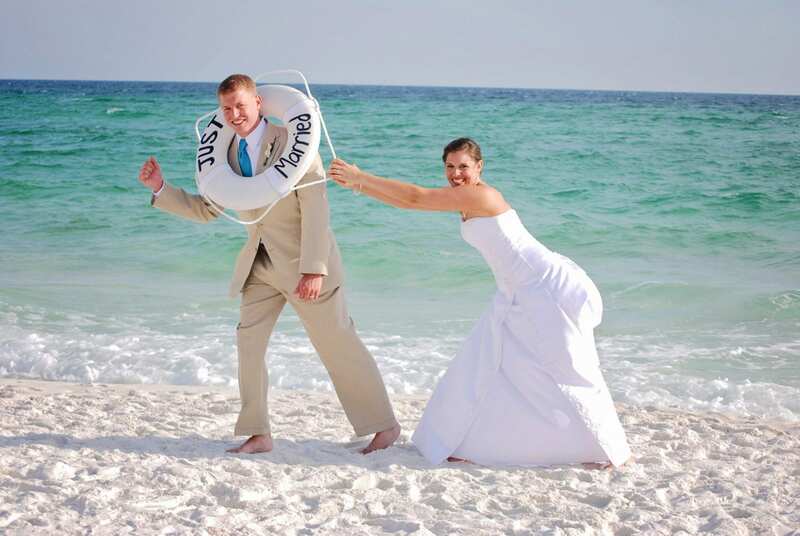 You can extend your trip to Destin for a few days after your wedding so you can enjoy a honeymoon. 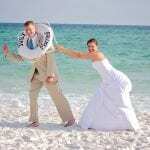 This is ideal if you do not have the time or funds to go on a honeymoon to another destination after your wedding. Florida beach weddings offer an experience that is one-of-a-kind. No hotel or party center in your hometown will be able to replicate the type of atmosphere that Destin beach offers. By hosting your wedding on Destin beach, you’ll give your guests the opportunity to attend a fun, laid back wedding in an incredible city. 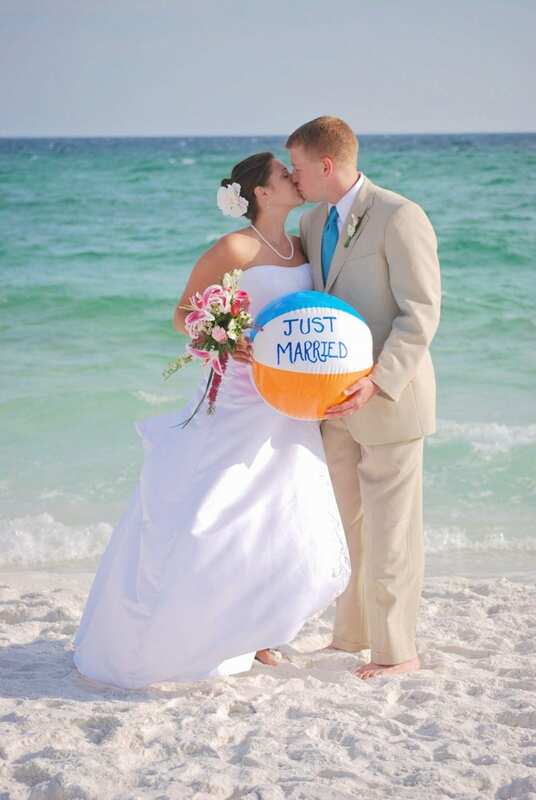 Your Florida Beach Wedding understands that every couple is different. That’s why, we offer multiple wedding packages to cater to everyone’s wants, needs, and budget. Let’s take a closer look at the wedding packages we have available. For a small wedding that features up to eight guests including you and your spouse, the Simply Florida package is ideal. This package was designed for couples who would like to elope and comes with a photographer, officiant, a natural bamboo canopy, a unity sand ceremony, white or ivory flowing material and the legal filing of your Florida marriage license. If you desire an intimate ceremony but do not want to elope, the Florida Nautical Knot package is right for you. It comes with seating for up to 14 guests and bamboo poles in your choice of color as well as a bamboo topper of white lilies, tropical flowers, or a stand of starfish. You don’t have to keep your wedding small if you don’t want to. The Florida Destiny package was created for Florida beach weddings with 50 guests or more. This package is well-equipped with up to 24 chairs, music, a decorated bamboo canopy, and so much more. It’s a great option for couples who don’t want the hassle that is typically associated with a larger wedding. 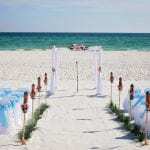 Your Florida Beach Wedding takes the guesswork out of planning Destin beach weddings. Regardless of where you live or what size wedding you’d like, you can count on us to plan and execute the wedding of your dreams. After you select the package that aligns with your budget and needs, you’ll reserve your wedding date. Next, we’ll send you an information packet that includes a contract and a form to fill out with your preferences. Once your special day arrives, you’ll receive a detailed agenda so you know exactly what to expect on your big day. 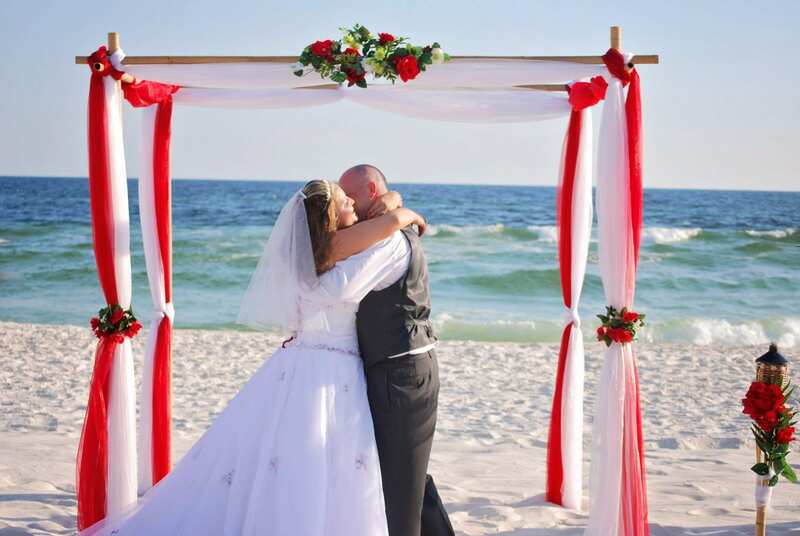 We encourage you to arrive to Destin beach a day or two before your wedding so you can see your ceremony site and get acquainted with the area. Our wedding coordinators will be happy to provide you and your guests with recommendations on things to do and places to stay. 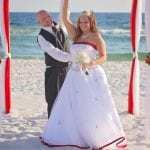 Are you interested in learning more about our Destin beach weddings? If so, we encourage you to browse our wedding packages and contact us today for more information. We can’t wait to hear from you and begin the exciting process of wedding planning.